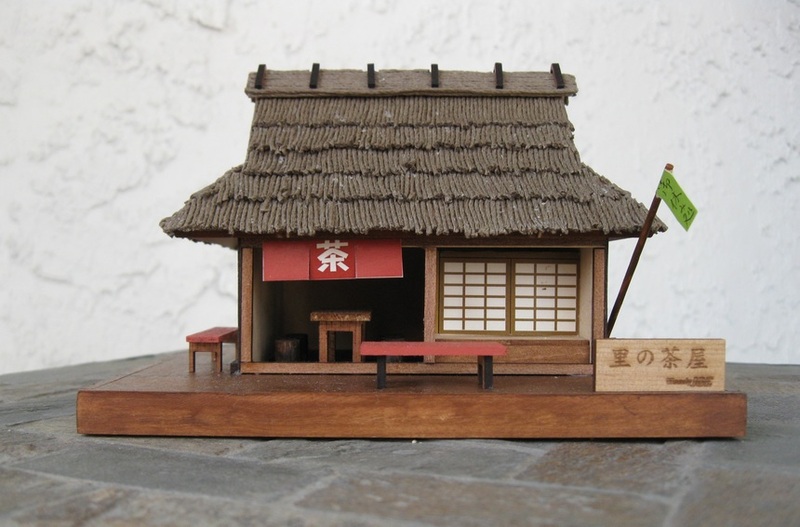 When I saw the design for a traditional version of a tea house, I couldn’t resist. The kits are beautiful things—full of lovely wood and veneers (cypress, cedar, etc.) and instructions entirely in Japanese with, thankfully, very clear building diagrams. 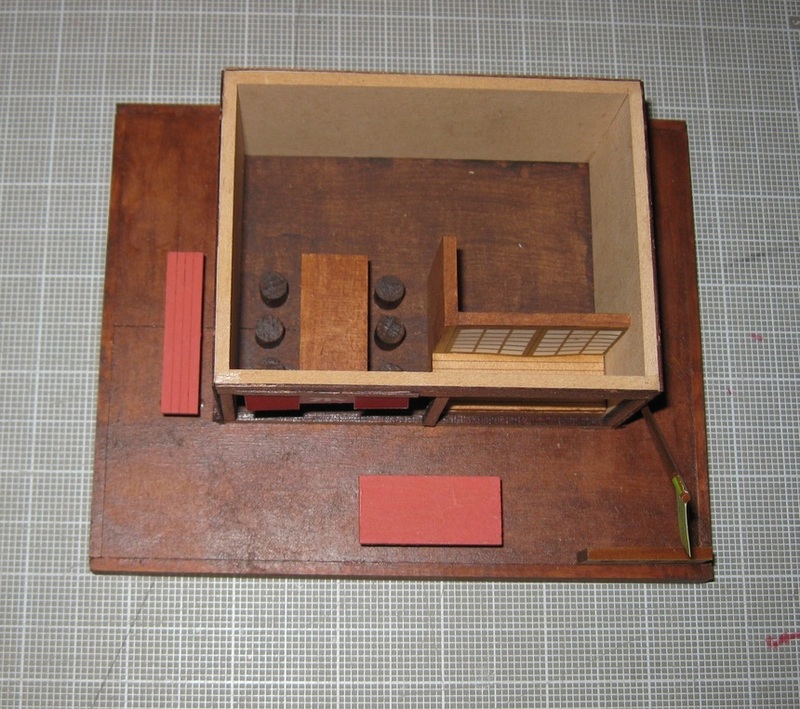 The tea house is a small model with a 6 in. by 4¾ in base. Many of their other models are huge and very expensive. 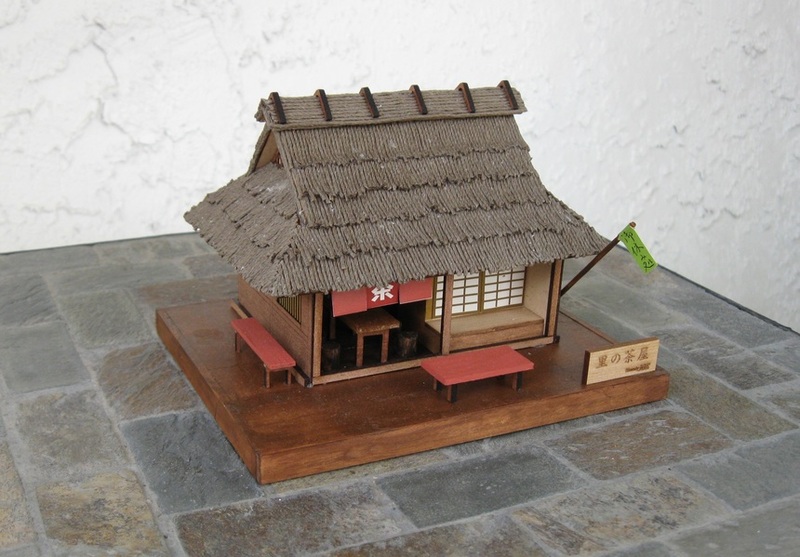 Here is the box for the Japanese tea house. 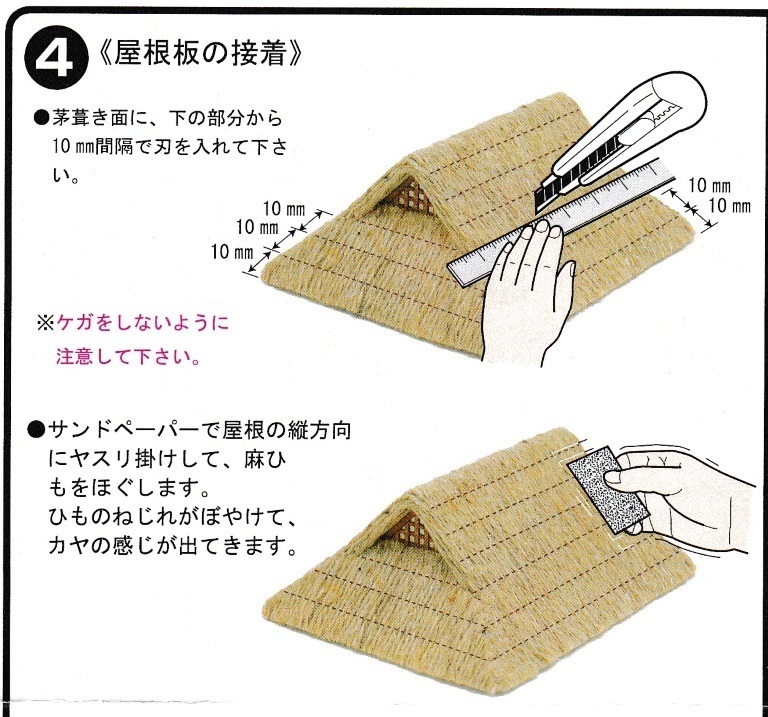 Here is one illustration from the instructions. 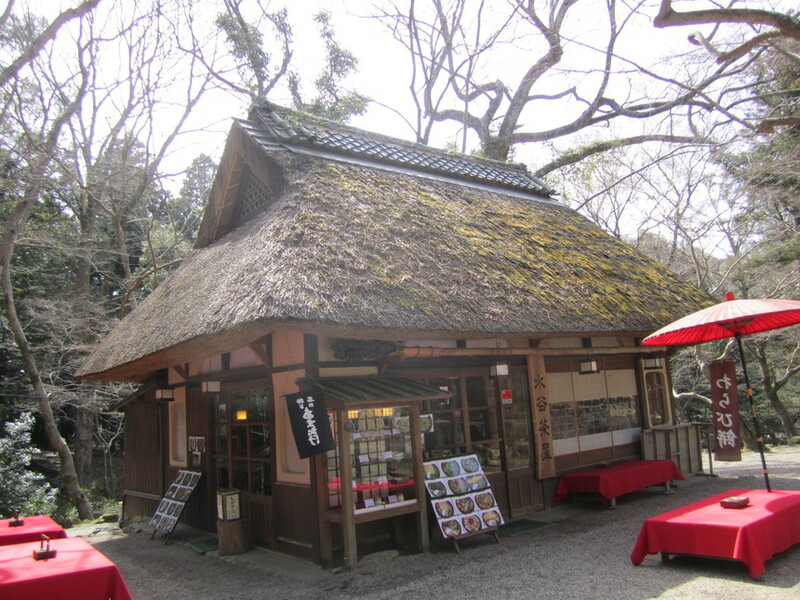 Notice—as I immediately did—the difference in the colors of the base and the thatched roof between these two photographs. This disparity immediately set me to thinking about changes, such as darkening the base and coming up with darker roof materials. 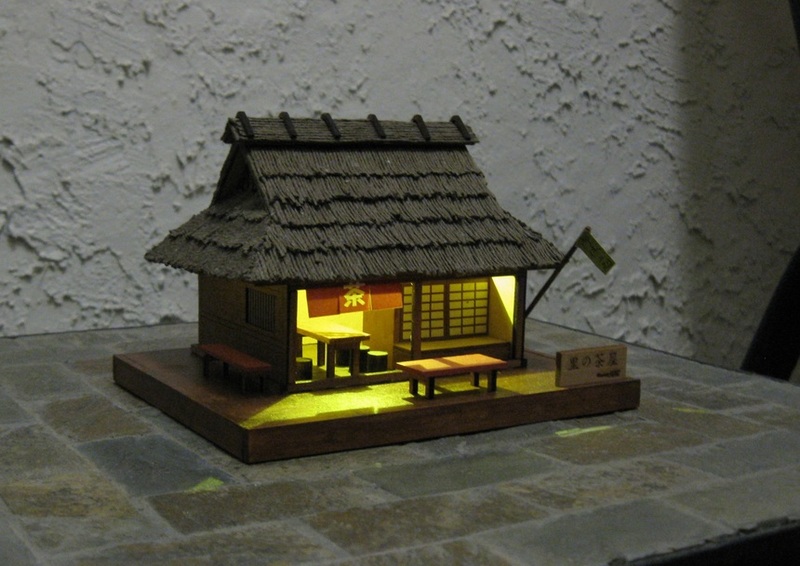 Lighting the wooden model was also on my mind. After assembling the base, I consulted with my local hobby shop from which I obtained some red/orange acrylic paint. 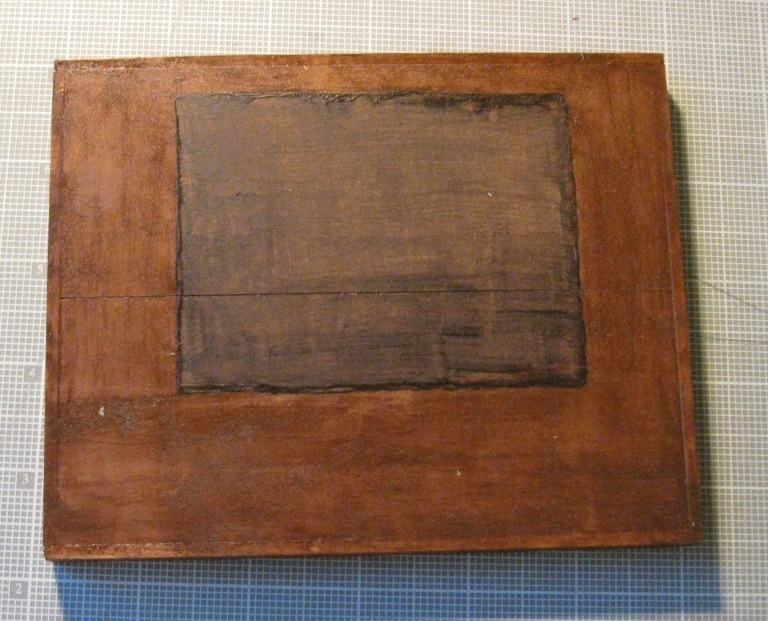 I ordered two colors (walnut and oak) of gel stain for wooden models and made sure of my supply of Aleene’s tacky glue. I used both colors of gel stain for some of the interior, for the stools and for the inside table. The acrylic paint was chosen for the two outside benches so as to match the color of the front hanging banner. 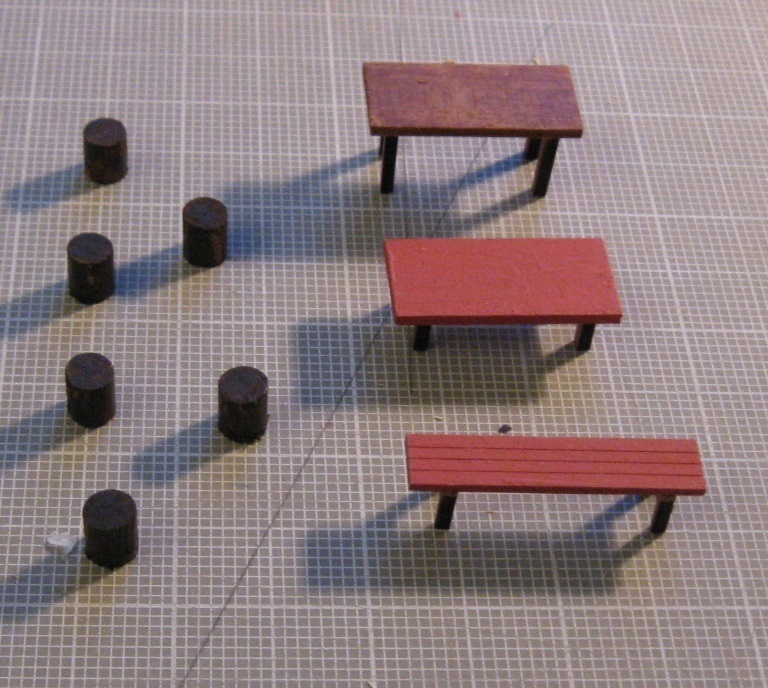 The model kit provided fold-able red paper to cover one bench but I preferred to go with the paint. 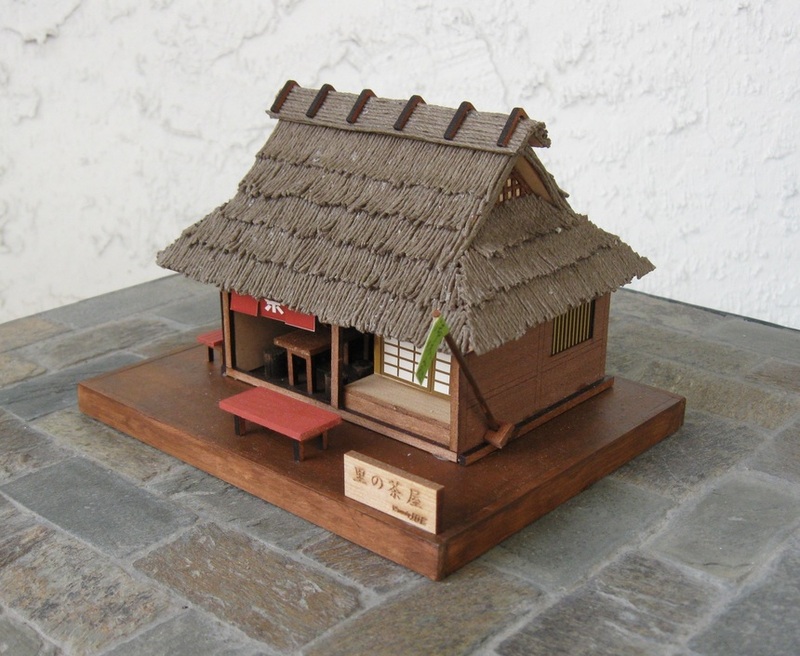 Woody Joe furnished a supply of light-colored unpolished hemp twine for the thatched roof. It looks like the thatch color in the photo above from the instructions and nothing like the much darker cover photo. After mulling this issue over for some time, I ended up ordering a spool of sage-colored polished hemp twine and devised an entirely different method for creating the thatch. 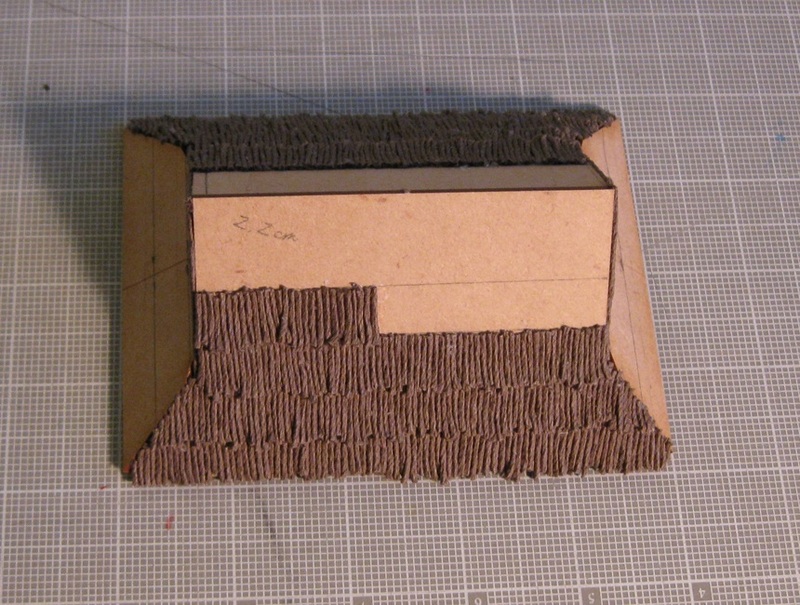 The original instructions provide a fairly odd method of gluing down long strips of the light, unpolished hemp twine and using a utility knife to make horizontal score lines and then using sandpaper to “fluff up” and/or "smooth" the thatch. 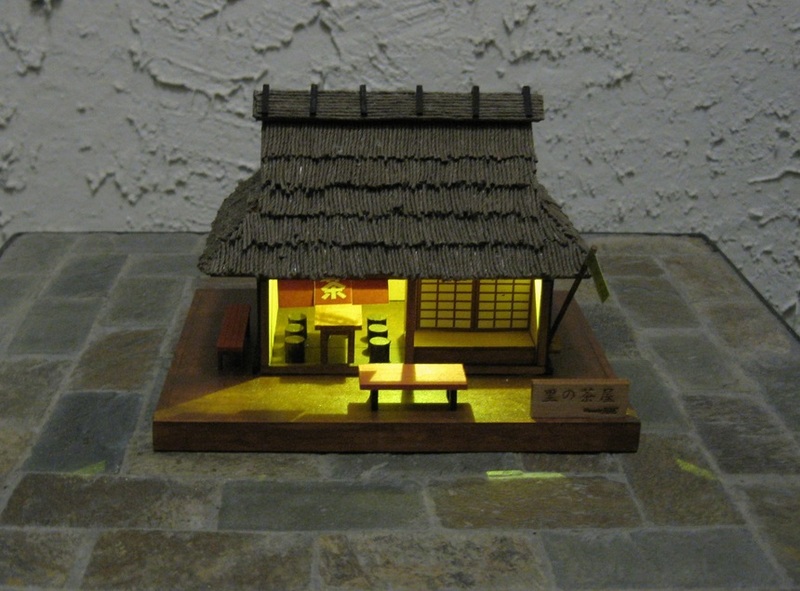 What’s a tea house without some sort of lighting? 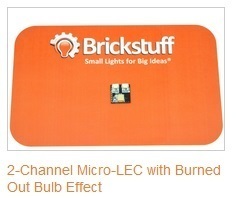 I finally had an excuse to use the following Brickstuff circuit. I imagined this might look a bit like a flickering candle which occasionally blows out. 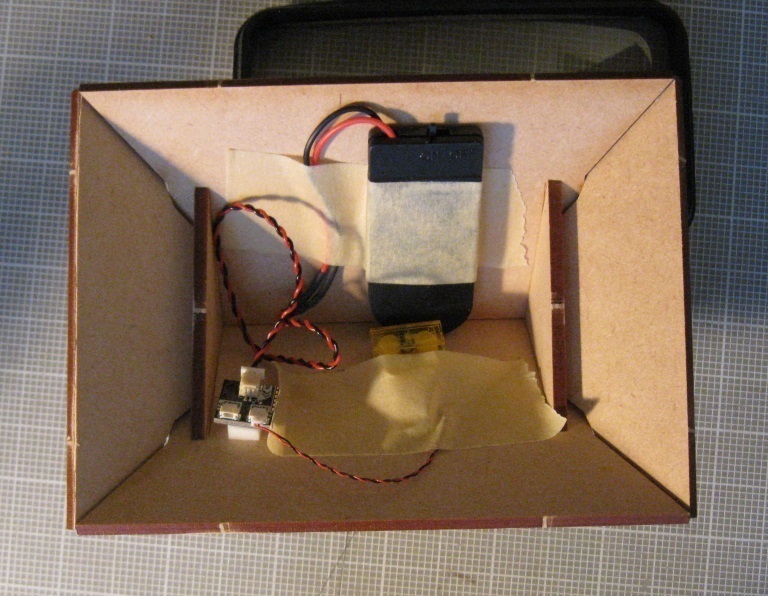 I installed the circuit, the power supply, one Pico LED, an adapter, etc., inside the roof. I sandwiched the LED underneath a yellow, transparent Lego tile. 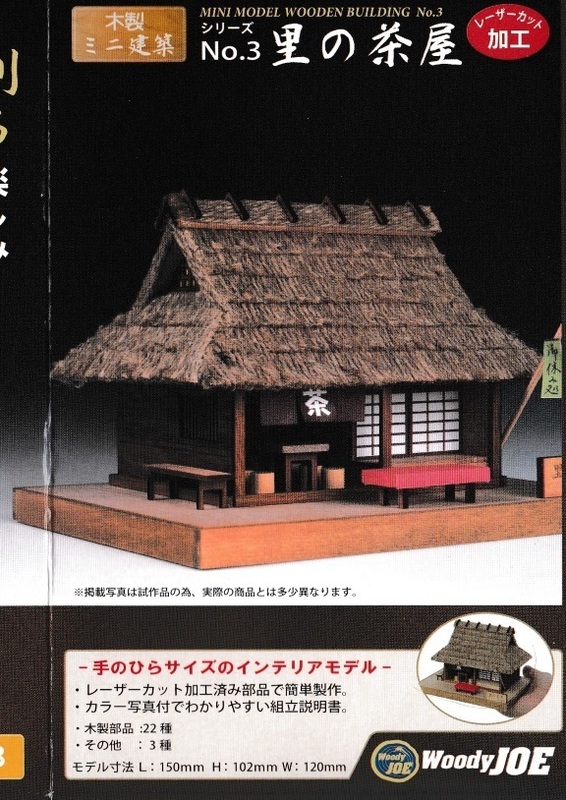 I aimed at least to come close to the impressive look of the Woody Joe tea house as shown on the box cover. 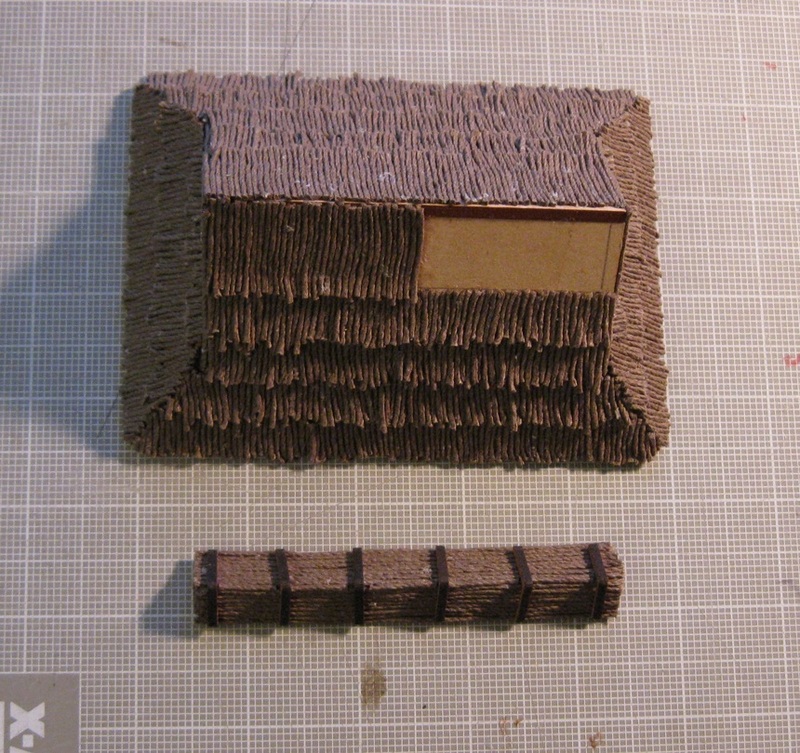 I think I accomplished that—with the possible exception of a few glue spots I couldn’t quite remove from some areas of the thatched roof. 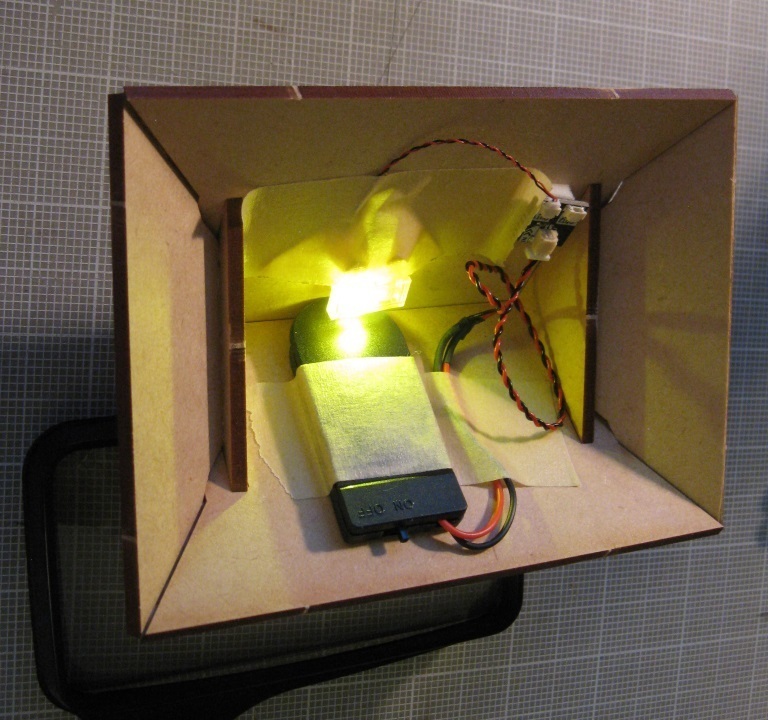 Here are a few shots, unlit and lit. Hi David Steere , another amazing project! I really admire the level of detail you bring to your models. 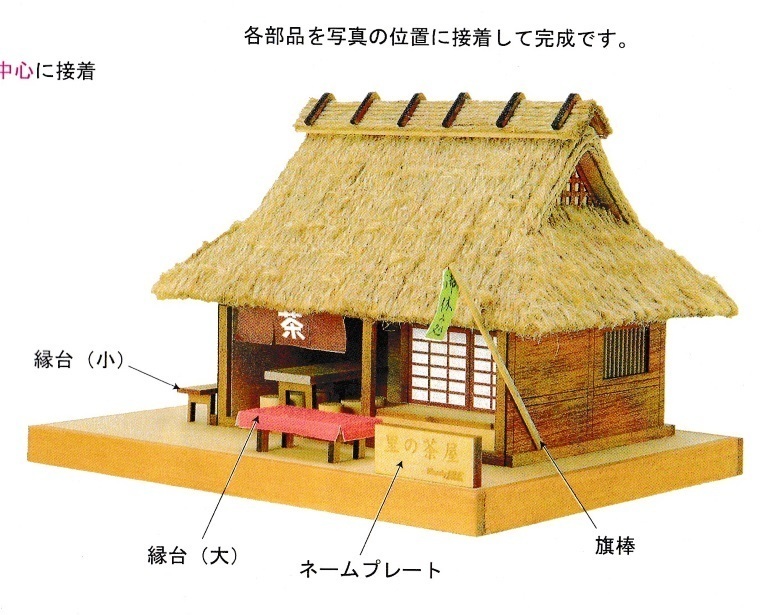 This one looks so realistic, and it's incredible to see the amount of thought that went into the detail work (especially the thatched roof!). The end result is amazing. Thank you again for continuing to find such creative uses for our products.